Upon the release of her new book Satire, Celebrity, & Politics in Jane Austen (Bucknell University Press, 2017), Jocelyn Harris was kind enough to discuss her research and writing on the witty English novelist. Jane Austen has been the subject for much of Harris’ work, and still is, as Harris continues to uncover new insights into Austen’s life and writing. As Harris puts it, Austen is “quite simply inexhaustible”—and as Harris’ responses demonstrate, new methods of research and deeper investigation reveal more about her with each new endeavor. Bucknell University Press: You state in your introduction that you “reconstruct Jane Austen’s creative process by means of the newspapers she perused, the gossip she heard, the streets she walked upon, and the sights she saw.” This method suggests a focus on environment, an almost anthropological study of a different time and place. What was the research process like in regards to uncovering evidence from the past? What challenges did you meet? What was the most rewarding? Jocelyn Harris: Distance is my biggest challenge, because I live in New Zealand, half a world away from the great libraries of Europe and North America. The Internet has quite simply changed my life. Exciting new resources such as databases of eighteenth- and nineteenth-century newspapers, digitized manuscripts, online books, blogs, and search engines all open up cultural and historical contexts that bring her back to life—as do new books and editions in print and e-book form, readily accessible articles on the web, and email suggestions from friends. Reading the magnificent modern editions of Fanny Burney’s letters and journals made me aware that snippets of her correspondence, obviously too good to ignore, reappear in Austen’s novels. My guess is that her mother’s gossipy cousin, who lived over the road from the celebrated author, could have told the family many a sensational tale of Burney’s life at the court of George III. With the help of the Internet, I realized that Austen probably based Elizabeth and Jane Bennet on two royal mistresses. Dorothy Jordan, celebrity actress, mistress to the Duke of Clarence, and mother of his ten children, seems to have inspired her creation of the lively Elizabeth, while Austen would identify a portrait of the regent’s mistress, Mrs. Georgina Quentin, as Mrs. Bingley. When the regent came courting this “professed spanker,” Georgina was living in Covent Garden, where Austen stayed with her banker brother, Henry. Most of Jane Austen’s correspondence has been lost, and she kept no diary. Therefore, I had to fill out her life by poring over her locations, her reading, her social and literary networks, her knowledge of current events, and her viewing of cartoons and portraits. While she is immortalized by her writing, Austen was a real person living during a unique moment in history. In your opinion, what is the most compelling piece of information that you learned about Jane Austen during the research process for this book? Austen is often regarded as a gentle, amusing ironist. But as the title of Satire, Celebrity, and Politics in Jane Austen indicates, I believe that she was a courageous political satirist. At a time when the cult of celebrity was in its infancy, she targeted celebrities, up to and including the Prince of Wales. Her in-jokes about public figures demonstrate her worldliness, her fascination with fame, and her relish of rumor. Austen attacks the prince yet again in Mansfield Park’s Henry Crawford, a man marked like him by caprice and unsteadiness. Crawford indulges in the “freaks of a cold-blooded vanity,” and rids himself of his money and leisure “at the idlest haunts in the kingdom.” In Persuasion, she criticizes Sir Walter Elliot’s status and power, as unearned as the regent’s, and praises Captain Wentworth’s merit and courage. Austen’s lacerating portraits suggest first-hand knowledge of the prince’s vulgar, voyeuristic, and self-indulgent ways. Considering again the study of place, if Austen had lived during this day and age, who do you think her subjects for inspiration might have been? How do you think the world would have reacted to her wit, humor, and criticism? A Regency woman in a golden age of satire, Austen attacked the Prince of Wales for his much-lampooned appearance, his lewdness, his vanity, his instability, his outrageous spending, his tremendous debts, his desire for absolute power, his implicit treason, his fondness for over-the-top building ventures, and his embarrassing braggadocio. Even court insiders warned that the prince was not fit to be king, and Austen wrote that she hated him. The current resurgence of political satire in social media, newspapers, and cartoons would have delighted this savvy, progressive, and thoroughly modern woman. Satire, Celebrity, and Politics being your third book on Jane Austen, how has your research evolved regarding your interest in her life and writing? Are there any questions that still need to be answered? What will you do next? I only want to know how Jane Austen did it (only!). In Jane Austen’s Art of Memory (Cambridge University Press, 1989), I followed the turns of her mind as she picked up elements from other writers and made them into her own. Undeterred by being a woman, she took whatever she wanted from anywhere. In A Revolution Almost Beyond Expression: Jane Austen’s “Persuasion” (University of Delaware Press, 2007), I traced her creative process in the only manuscript to survive from her published novels. In the cancelled chapters of Persuasion, she deletes, interlineates, writes new material in the margins, and sticks on a scrap with a wax wafer. Eight days later, she threw all that away, and wrote some of the most remarkable scenes in her work––the last chapters of Persuasion. She was indeed a true professional. At a time of hardship, inequality, and war, Austen wrote, “How much are the Poor to be pitied, and the Rich to be blamed.” In Persuasion, she attacks the class hierarchies propping up the society of her day. In a highly subversive move, she sets Sir Walter Elliot’s Baronetage against Captain Wentworth’s Navy List, pride of birth against pride of accomplishment. The aging patriarch of the Elliots cannot compete with the glamorous young Captain Wentworth, who derives from real-life heroes such as Lord Nelson, Lord Byron, and Captain Cook. So too, in this brave new world of energy and achievement, the faded beauty of Bath gives way to the Romantic sublimity of Lyme Regis. In this eloquent novel about second chances, Anne Elliot finds a fragile happiness. Jane Austen is quite simply inexhaustible. I’m writing about her relationship to Madame de Staël, the foremost woman genius of the age; the London locations where she could have seen contemporary cartoons; and her continual fascination with Fanny Burney. There is always more to find out about this extraordinary woman. 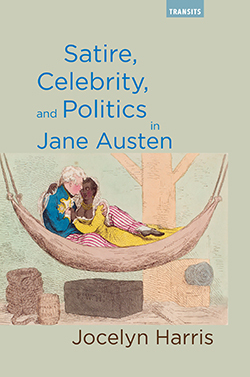 For more information on Austen, take a look at Harris’ latest book Satire, Celebrity, and Politics in Jane Austen. To order visit www.rowman.com or call 1-800-462-6420. Use code “UP30AUTH17” to save 30% on the list price (not valid on eBook).